D-R gets one back, a 16-yard run by Eric Teixeira. 41-6. 4:57 left. Rob Antonucci fumbles a snap, 22-yd loss SL recovers on the Westwood 8 with 1:15 left in the 3d. Jordan Phillips scores from 8 yards out for Wareham. Rush failed. 42-12 EB. With two seconds left in the 3d quarter, Phil Lashley punches it in from 3 for SL. Alec Snell to Nick Webby pass, it's 22-20, Westwood. 1:13 to go. KP fourth and 2 coming up. Adam Briffett makes the tackle and Marshfield takes over. Start at their own 19, 1:08 to go. Final: Holliston 41, Dighton-Rehoboth 8. Panthers will face Hanover in a D4 South finals rematch. FINAL: King Philip 14, Marshfield 7. KP seals it with an interception and advances to the D1A South final. Final: East Bridgewater 42, Wareham 12. With 1:23 remaining down 28-22, CM has 4th and 15 on their own 38. 4th and 10 for CM on the Xaverian 11. 19 seconds left. CM touchdown from 11 yards out. 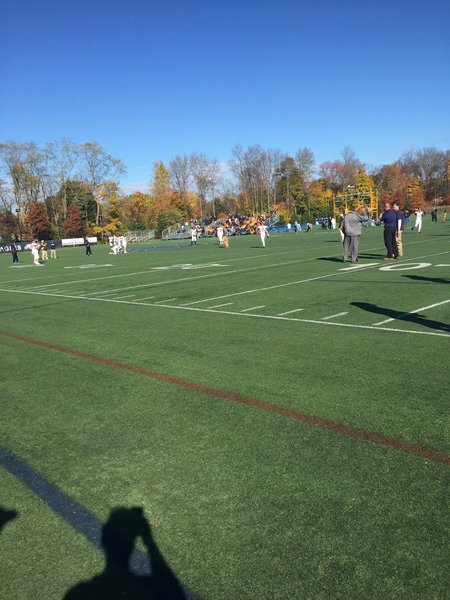 Xaverian recovers with 8 secs left. Build off of last weeks win. Win. The. Day. Go Ducks. Andover wins the toss and will receive.